Well, everything got finally arranged... I just received the registration confirmation of my first Oracle Open World. I really liked my first stay in the United States; ODTUG in Washington... Now I'm looking forward to visit San Francisco and meet my online Oracle friends in "real life"! Almost all hotels near the Moscone Center were fully booked, so I'm staying in the "Best Western Grosvenor Hotel SFO", 380 South Airport Boulevard, South San Francisco, CA 94080. Somebody else staying there too? - Tue 24/10 at 7pm: "OOW2006 Blogger Meetup", organized by Mark Rittman in the "Thirsty Bear Brewing Company", just around the corner from the Moscone. Afterwards there's also the Appreciation Event with sir Elton John. - John Scott and I are also organizing an "OOW APEX meetup" evening! You can subscribe here. The post in the APEX forum is here, initially started by Joel Kallman. A patch for Oracle Application Express 2.2 is released on the 14th of September. This release fixes several issues in Application Express 2.2, you find the details below. 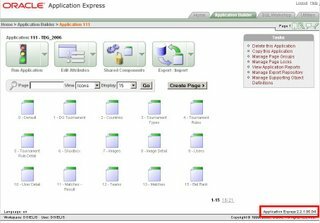 The full installation of Application Express 2.2.1 can be downloaded from the OTN Site. The Application Express 2.2.1 patch set, to be applied to an Application Express 2.2 instance, can be downloaded from MetaLink (Patch Number 5500033) and is about 2.6MB. 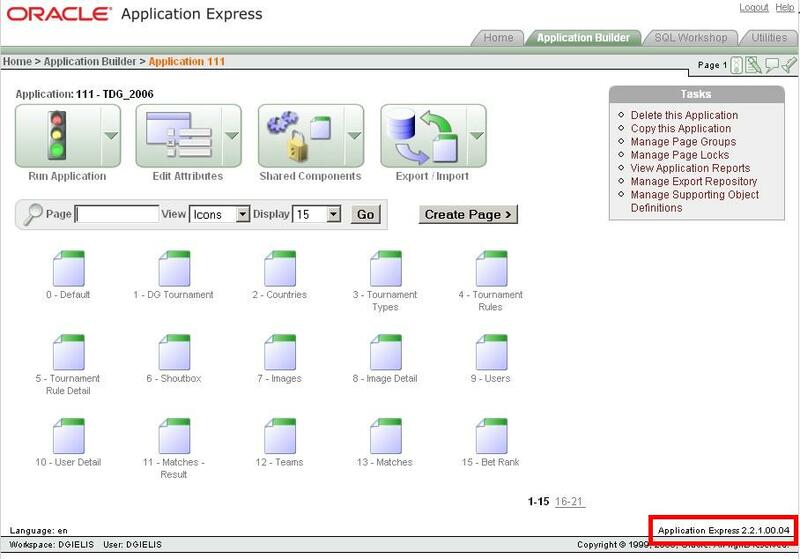 If you're working with Application Express 2.2 and XE, you should read this. The table below contains a list of the bugs fixed with the Oracle Application Express 2.2.1.00.04 release. 5459267 Substitution Message Is Not Displayed While Importing Application Export File. Although this feature already exist a long time in Oracle, I'd like to share my experience using "updateable views" together with APEX. I've a table "Teams", a table "Team Groups" and a table "Team Team Groups" (which teams are in which groups - many/many relationship). 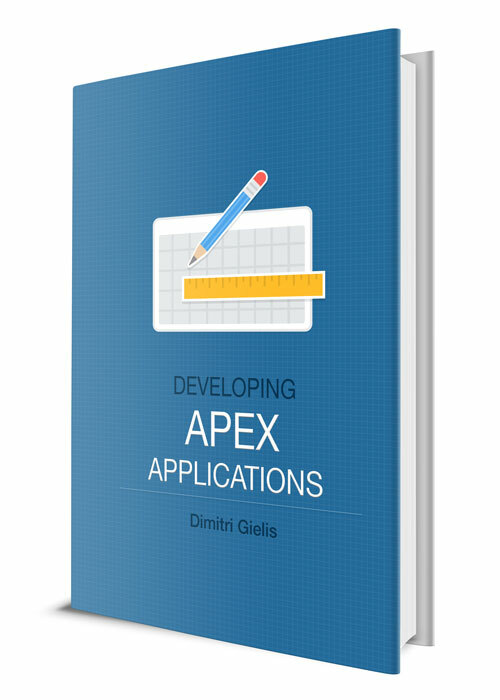 To speed up the inserts in an APEX application, you wouldn't create two insert pages (one per table), but only one page which handles the inserts for you. You can for ex. write some (APEX form) processing which will insert the data into the two tables or tell all items to which table they belong and adapt the standard processing. I didn't use any of these, I did the insert through a view... I built an APEX tabular form on top of the view and had my GUI very quick and easy! I found it very useful to speed up my inserts like this and this solution also works from SQL Plus, SQL Developer, etc. We booked the One & Only Le Touessrok hotel. We can recommended Mauritius and this hotel in particular to everyone! 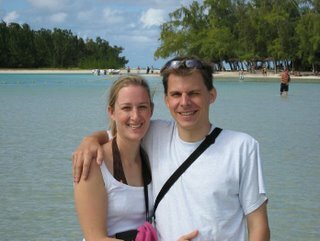 We had a wonderful honeymoon and were treated as royalties! We stayed in the Junior Suite 283 on the Frangipani Island. One word: "Luxe". I can write pages of our stay, but I suppose this isn't interesting enough for everybody ;-) You find some more information and pictures of the hotel here. So, now a question for you! Any news in the Oracle world in the past two weeks?